Annual herb from a taproot; stems decumbent to erect, freely branched, 0.1-1.0 m tall/long. Lower leaves opposite, upper leaves alternate, stalked or stalkless, lanceolate to oblong or rounded, 2-10 cm long, the bases smooth or toothed, covered with a whitish mealy substance when young but becoming glabrous and greenish with maturity. Inflorescence of terminal or axillary spikes or panicles; pistillate bracteoles only slightly thickened basally or not at all, largest ones strap-shaped or narrowly egg-shaped, 4-12 mm long. Membranous pericarps; seeds erect, 1.5-2.7 mm long. Moist to mesic shorelines in the lowland zone; infrequent along the coast; N to AK. "The genus Atriplex, commonly called orache, atriplex or saltbush, of the family Chenopodiaceae (the goosefoot family), comprises nearly 200 species. The genus has a worldwide distribution, occurring on all continents except Antarctica. Most of the species are halophytes of coastal or inland saline habitats; a few are widespread ruderals of disturbed ground." (Bassett et al. 1983). Bassett, I. J., C. W. Crompton, J. McNeill and P. M. Taschereau. 1983. The genus Atriplex (Chenopodiaceae) in Canada. Monograph #31, Agriculture Canada, Ottawa. Atriplex gmelinii var. zosterifolia (Hook.) Moq. 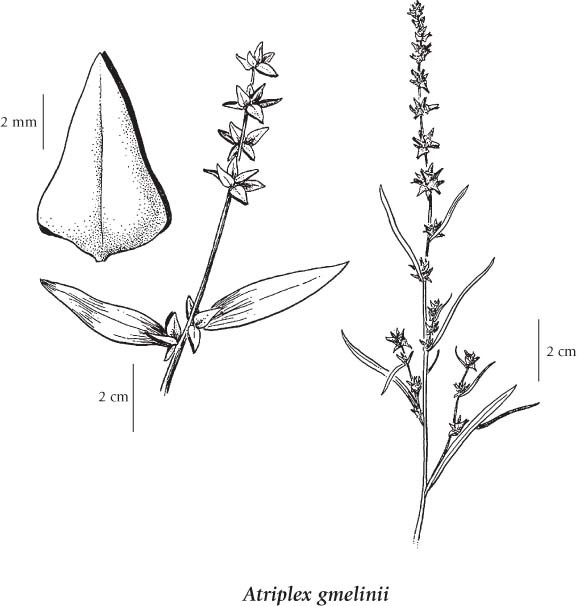 Atriplex patula subsp. obtusa (Cham.) H.M. Hall & Clem. 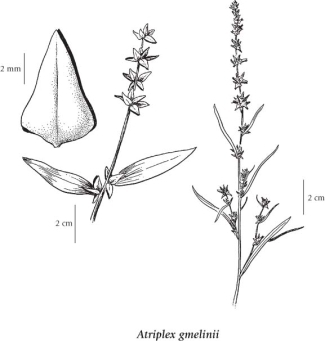 Atriplex patula var. zosterifolia (Hook.) C.L. Hitchc.